Distribution map of Walker's manioc (Manihot walkerae ). Walker’s manioc grows in southern Texas in Duval, Hidalgo, and Starr counties as well as the state of Tamaulipas in northern Mexico. Walker’s manioc is a perennial plant, which dies back during dry periods or following a freeze. The fleshy, underground root stores water and nutrients, and produces new stems each year. The plant has a dull almond odor caused by the presence of hydrogen cyanide in all parts of the plant. Otherwise reclining, the stout, but supple stems will often use other nearby vegetation for vertical support. Leaf stalks attach to the middle of each leaf blade, instead of the more common attachment at the edge of the leaf blade. Leaves grow up to 14 cm long by 11 cm wide, and usually have three to five deep, rounded lobes. The elaborate lobes vaguely resemble a fiddle in outline. The white, five-lobed flowers arise from the same point as a leaf off of the main stem. Female, fruit-producing flowers occur separately from male, pollen-bearing flowers. 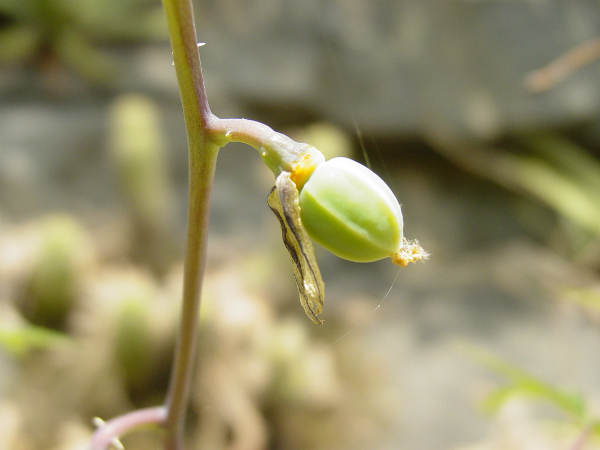 Immature fruits resemble a small, white-striped, green marble. Mature fruits dry and break open to disperse three seeds. 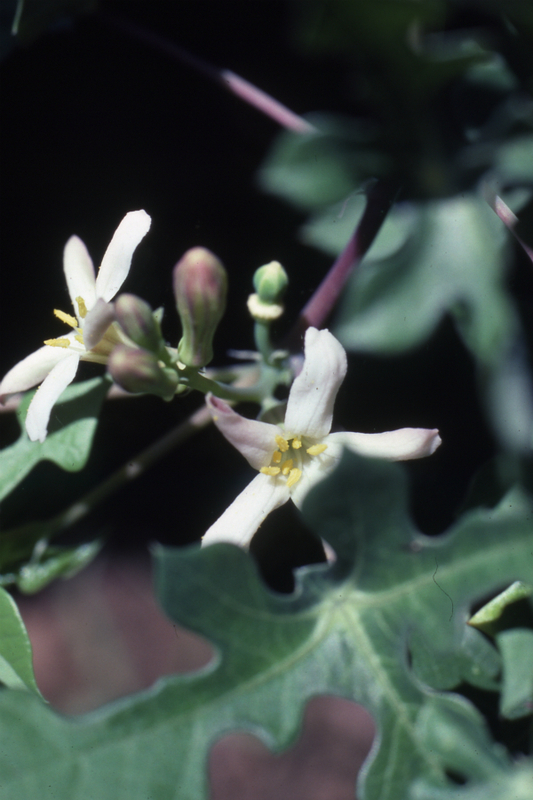 Walker’s manioc has white, five-lobed flowers. These flowers are male, pollen-bearing flowers (which occur separately from female, fruit-producing flowers). Walker’s manioc has elaborate leaves, usually with three to five deep, rounded lobes. This leaf has three larger lobes and two smaller lobes. Jicamilla (Jatropha cathartica) has somewhat similarly shaped leaves, but the leaf edges are saw-toothed instead of smooth. Also, jicamilla has red flowers, instead of white. 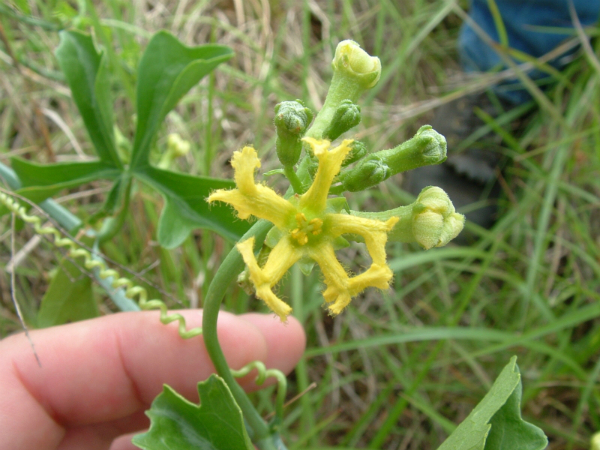 Balsam gourd (Ibervillea lindheimeri) is a vine with thinner stems, yellow flowers, and red fruit. 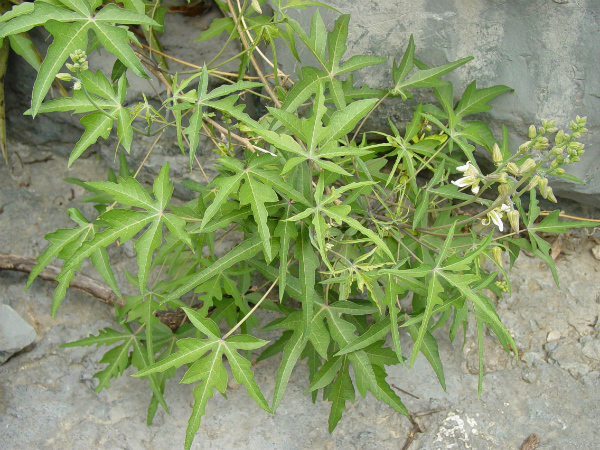 Although it uses other plants for support, Walker’s manioc is not a vine. 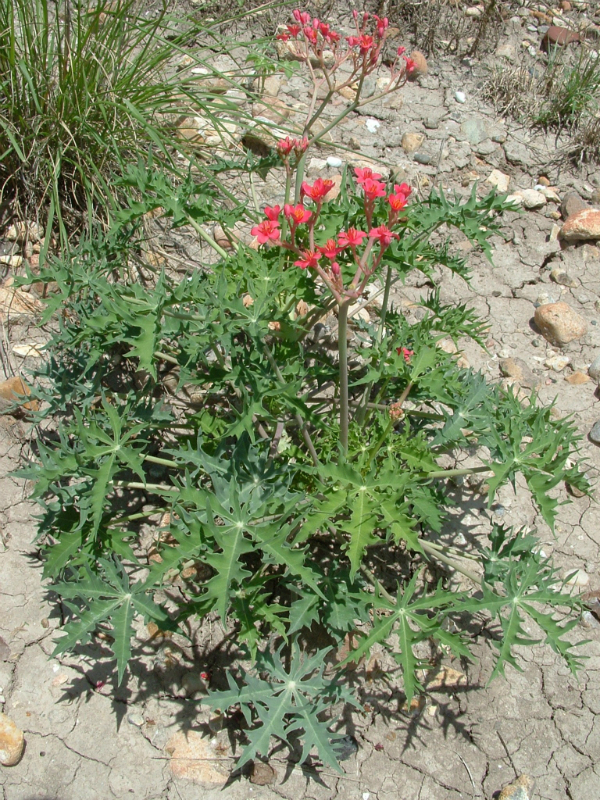 Another manihot species (spiked manihot) occurs in Texas, but not in the immediate area of Walker’s manihot. Spiked manihot (Manihot subspicata) lobes are narrow and fruits are oval. Balsam gourd has yellow flowers. 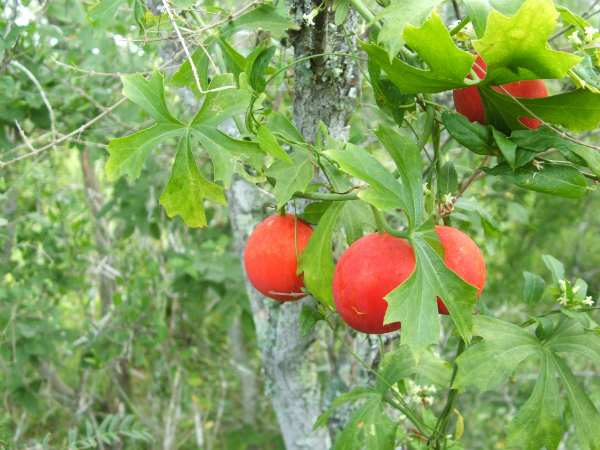 Balsam gourd is a vine with red fruit. Spiked manihot usually has three to five deep, narrow lobes. Spiked manihot has oval fruits. Jicamilla has red flowers and saw-toothed leaf edges. Walker’s manioc grows in thorn shrublands on shallow, sandy soils often over hardened caliche. Habitat of Manihot walkerae. The stems often use other nearby vegetation for support and growth. 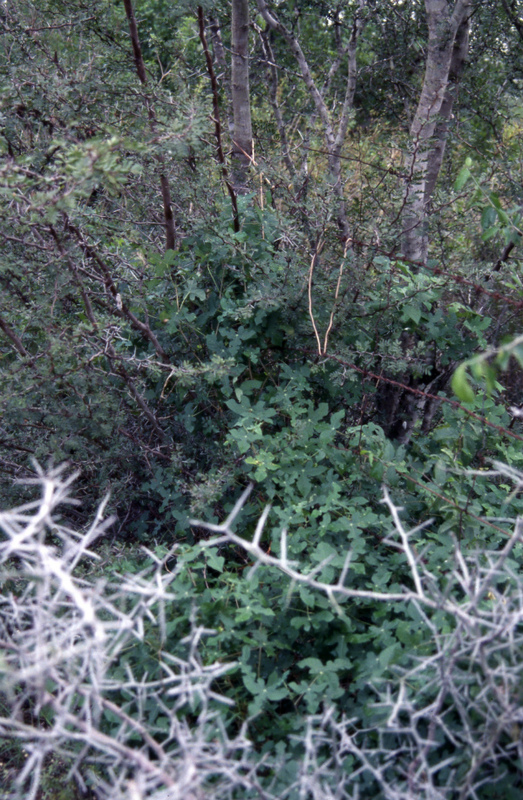 The image shows lotebush, acacia and even barbed wire being used as vertical support. Credit: Dana Price - Texas Parks & Wildlife Dept. Flowering occurs from April to September. 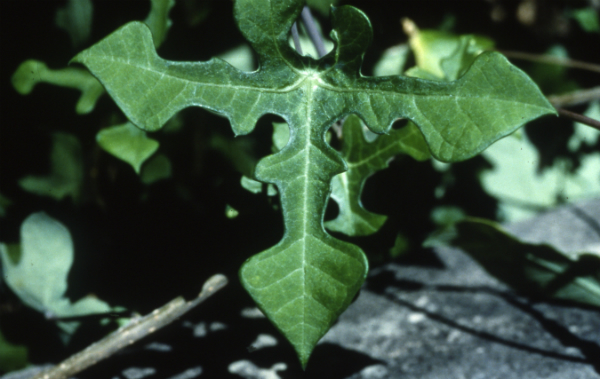 Walker’s manihot dies back during droughts or after a freeze, but during warm months with typical precipitation, it is recognizable by its distinct leaves. Seed dispersal, specifically explosive seed dispersal, can be one of the fastest movements in plants. Explosive seed dispersal is seen in several different groups of plants, including impatiens. In Walker’s manioc, the fruit splits open and forcibly ejects the seed up to several meters from the parent plant. This mechanism can substitute or bypass other types of dispersal like animals, wind, or water. Correll, D.S. and M.C. Johnston. 1970. Manual of the vascular plants of Texas. Texas Research Foundation. Renner, TX. Carr, W.R. 1995. Rare plant surveys on Lower Rio Grande Valley National Wildlife Refuge tracts, December 1993-July 1995. Austin: Texas Parks & Wildlife Department. Pronatura Noreste, A.C. 2005. Status, distribution, and conservation of three species of rare plants in the Lower Rio Grande in Mexico. Section 6 final report. Austin: Texas Parks & Wildlife Department.